As long as anyone can remember, Britain's old industrial heartlands have been a disaster area. Once they'd lost their traditional industries like steel and shipbuilding, something very bad happened to them - they seemed to lose the will to live. And as we've blogged many times (eg here), despite decades of political promises and billions of tax-funded support, they have never managed to leave the high dependency unit. For example, when last sighted - in 2007-08 at the height of the biggest economic boom the world has ever seen - around 55% of the North East's GDP comprised government spending. It will be even higher post-Crash (see chart above). Now George Osborne has joined the long succession of politicos who want to do something. Among other things he wants to connect up our failing cities to a high speed rail network and superfast broadband. Sounds kind of sensible - if very expensive - but given the record, why should we believe that will be any more succesful than the motorways (and that famous White Elephant across the Humber) were back in the 60s and 70s? No, after more than half a century of failure, it's time we started thinking much more radically. One possiblity would be to close the North. This was pretty well what think-tank Policy Exchange suggested back in 2008 (see this blog). They advised we recognise reality, pull down the shutters on basket cases like Liverpool, Hull, and Tyneside, and ship their populations down to the prosperous (pre-Crash) South. Needless to say, they were immediately condemned for urbanocide by all and sundry, including Mr Cameron. The good citizens of Guildford weren't too keen either on account of needing to build 30,000 workers flats on Stoke Park. Fortunately there is another more attractive option - one whose time has surely come. "Paul spoke about his pioneering idea that city-sized areas can be created in developing countries so that their citizens can experiment with better rules. An example would be the experience of Hong King in China. He stated that by setting examples in these areas, better rules and new ideas can spread more quickly. Paul argued that large-scale migration is no longer possible. Hundreds of millions of people cannot move to places with better rules and laws. Instead they can move to Charter Cities." Romer's proposal focuses on helping the populations of developing countries through the establishment of brand new self-governing mega-cities located on the coast for easy access to the outside world and a ready supply of water. Like old-time Hong Kong and Singapore, these Charter Cities would be dedicated to hard work and enterprise; tax and economic regulation would be minimal, with for example, no minimum wage and no social benefits. But crucially, the rule of law - both criminal and civil - would be paramount, and guaranteed by some strong third party from the developed world outside (and if you're thinking that sounds awfully like the British Empire, so were we). In truth, most of the audience seemed sceptical that this proposal could ever fly (for example, what's in it for the guarantors?). But what if instead of establishing new Charter Cities on the coasts of developing countries, we simply reconstituted some of our own dying coastal cities? Liverpool, Hull, and Tyneside would be good places to start. 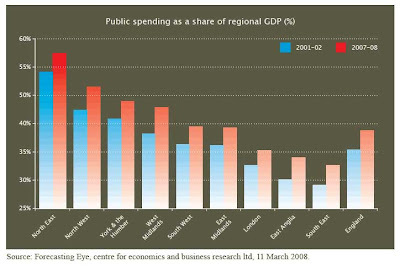 Public spending as a percentage of GDP would obviously fall sharply, and those that depend on public spending would certainly feel the squeeze (although welfare recipients could be given the option of staying on benefit if they relocated outside the City). But against that, Hull would attract entrepreneurs and private investment on an unprecedented scale - and with its easy European access, much of the inflow would come from overseas. There would soon be jobs for all. Do you honestly think faster trains and better broadband are the answer? PPS Romer's real claim to fame is in developing his path-breaking endogenous growth model 20 years ago. Yes, that is the same endogenous growth that has guided the Great Helmsman so successfully.